During the late 1840s and the 1850s, there was a large influx of Irish families into the Richmond Hill district of east Leeds. 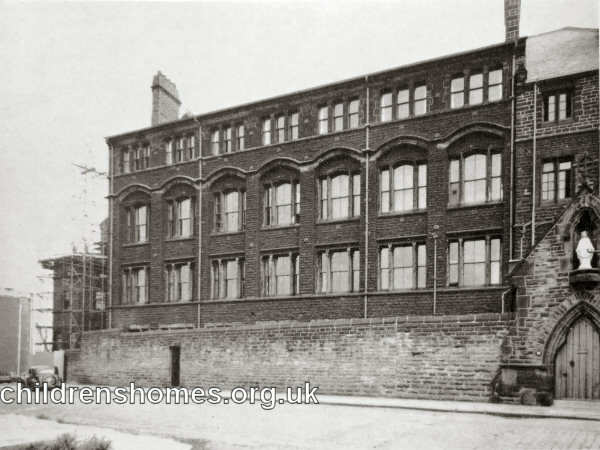 Many children from these families eventually ended up in the care of the Leeds workhouse authorities, who were reluctant to make any special provision for their religious instruction. The Catholic community eventually raised funds for the founding, in 1858, of a convent for the Oblate Sisters of Mary Immaculate of L'Osier to begin working in support of Catholics in the area. In 1863, the convent building was extended to house the St Mary's Orphanage for Roman Catholic Girls, also known as the Mount St Mary's Orphanage. The first inmates, six young girls, were admitted on 11th October, 1863. Fund-raising for the institution continued, with the large sum of £1000 being raised in June, 1865, by a Grand Bazaar at Leeds Town Hall to which items for sale had been donated by Pope Pius IX and members of several European royal families. In 1871, the Orphanage moved into its own separate building at the west of the convent, the previous accommodation then being converted for use as an infirmary. On 31st May, 1871, the Orphanage was accredited as a Certified School, allowing it to receive girls boarded out by the workhouse authorities. At the outset, some Boards of Guardians refused to place their Catholic children at St Mary's, but those that did included Leeds, Keighley, Scarborough, Ecclesall Bierlow and Sculcoates. Girls from other sources were also accepted for a payment of £10 to £12 a year. In 1884, the establishment could accommodate up to 100 girls, aged from 4 to 10 years at their date of admission. The older girls were trained for domestic service and occupied in laundry work. In 1925, the Society acquired a property at 27 Church Street, Boston Spa, as a holiday home for girls from St Mary's. It was given the name St Joseph's. In 1949, the property was enlarged and became a residential home for 33 girls. The Mount St Mary's site continued in operation until 1954, by which date over 3,000 children had passed through it. The girls then in residence were moved to smaller, family-group houses at Knaresborough and at Allerton Park, Leeds. The Orphanage building was subsequently incorporated into the Mount St Mary's Catholic High School and still stands. Catholic Care (Diocese of Leeds), 11 North Grange Road Headingley, Leeds LS6 2BR. Holds any surviving personal files. Leeds Roman Catholic Diocesan Archives, Hinsley Hall, 62 Headingley Lane, Leeds LS6 2BX. Holdings include St Mary's Orphanage Annual Reports (1865-98); Leeds Diocesan Rescue & Protection Society Annual Reports (1912-1989); and a few other documents. West Yorkshire Archive Service - Leeds, Nepshaw Lane South, Morley, Leeds LS27 7JQ. Has a few documents relating to the Orphanage.